With 5 CRBB super corrosion-resistant ball bearings, roller bearing, and free-floating spool technology, Daiwa's TD Luna Round Baitcast Reel is one of the smoothest saltwater baitcasters ever. And to tame the beasts, it's built for bear at every turn: the hard-anodized 1-piece frame is machined from solid bar stock aluminum, and the titanium nitrided stainless steel line guide can handle braid or mono with equal ease. Machined aircraft aluminum spool; 6-point drive train support; Dura-Loc pinion. Magforce-Z anti-backlash system (on 100 and 200 Series) or Centriflex cast control (300 Series). Infinite anti-reverse. Ultra-smooth fiber-composite/stainless multi-disc drag -- no chatter, no fade, wet or dry! Equipped for fast takedown. "Don't hesitate to get this reel. I fish both freshwater and saltwater. From inshore to offshore using the Daiwa Luna... as a matter of fact I have two always rigged to go because there is almost nothing they can't handle." 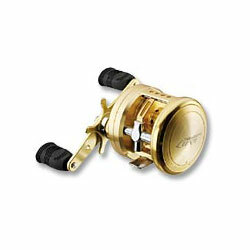 "I fish for inland stripers and blue in the rivers here in southern maine, This reel handles just about anything. I hooked a 4 foot bull shark that was chasing mackerel up the river and the drag handled all the runs and pulling this fish could muster. "